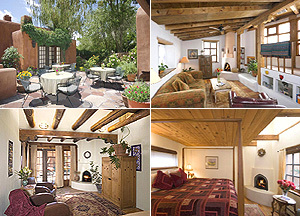 A world of beauty and hospitality awaits you at Hacienda Nicholas, an enchanting Southwest bed & breakfast inn. 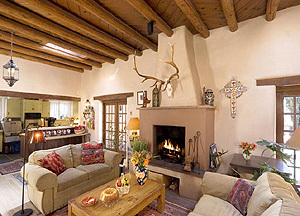 Whether you're here for a romantic weekend or a winter getaway, the innkeepers are committed to providing superior personal service, insuring you a memorable Santa Fe vacation. The extra thick adobe walls of this authentic hacienda provide a peaceful refuge from an often overwhelming world. Located in the heart of historic Santa Fe, the inn is built around a delightful garden courtyard, complete with outdoor kiva fireplace. Savor the delectable breakfast buffet while relaxing in front of the welcoming fireplace of the "great room." After a full day of hiking, skiing, or touring Santa Fe's sights, wine and cheese will welcome you back to the inn. The knowledgable staff is happy to help you with your dinner plans, after which you'll melt into a heavenly bed of fine linens, feather and down. Hacienda Nicholas makes a special effort to accommodate those seeking a healthy organic and vegetarian bed & breakfast, using only hypo-allergenic, green cleaning products. Come stay at Hacienda Nicholas, and experience the warmth of a visit with intimate friends while enjoying all the comforts of a fine hotel.